A summary and download of a letter from Heather Majaury to the Algonquins of Ontario organization; an in-depth critique of the Proposed Agreement-In-Principle that will be voted on in the coming months. The letter is cc’ed to relevant provincial and federal government representatives and ministers. Scroll down for context, summary and links, also with related resources at the bottom. Image description: Resembles the Canadian flag, with red bars on each side and white in the middle. Where the maple leaf would be, is an outline of the territory under negotiation, with little sections in colour that are the land that will be kept by the Algonquin under the agreement. 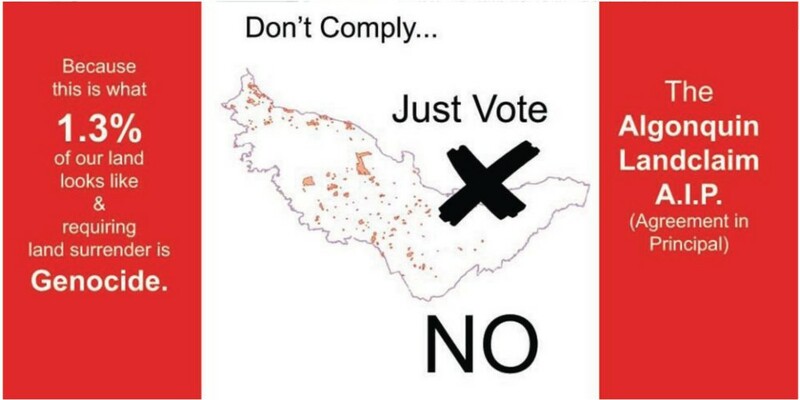 Words in left bar: “Because this is what 1.3% of our land looks like & requiring land surrender is Genocide.” Words in middle: “Don’t Comply… Just Vote NO”. Words in right bar: “The Algonquin Landclaim A.I.P. (Agreement in Principal)”. The ‘Algonquins of Ontario’ (AOO) was created in 2006 as an organization to carry out the land claims process; the AOO decision-making body consists of the chief and six council members of the Algonquins of Pikwakanagan First Nation, along with one elected ‘Algonquin Negotiation Representative’ (ANR) for each of the nine non-status Algonquin communities included in the claim. This land claim process was initially started by Pikwakanagan in 1983, with the provincial and federal governments accepting the claim to negotiate in 1991 and 1992 respectively. The land under negotiation (click for map) has never been ceded or surrendered. It consists of approximately 36,000 square kilometres of eastern Ontario (although unceded Algonquin territory does not stop at the Quebec border): the southern boundary goes from North Bay in the northwest, southeast almost all the way to Kingston, and then northeast to Hawkesbury, with Brockville and Cornwall excluded. The northern boundary is the Ottawa River aka the provincial border; the city of Ottawa is included in this territory, as is almost all of Algonquin Park. An unsatisfactory one-time “buy out” amount of $300 million, with no ongoing revenue streams or revenue-sharing agreements concerning the territory’s natural resources or land, nor any recompense for the hundreds of years of damage, pain and suffering inflicted upon many generations of Algonquin people. “Microscopic” amounts of ‘fee simple’ land; only 117,500 out of approximately 9 million acres. The comprehensive land claims process not being acceptable under international legal standards, not including Algonquin Anishinabeg language and legal concepts, and lacking engagement from many of the enrolled Algonquin people. The issue of the debt incurred by the Algonquins to participate in the process with no way to pay it off other than from the money in the final settlement. Lack of recognition of the overlapping land title and rights of other Algonquins who are not included in the negotiations. Indemnity of the Canadian state from any actions taken in advance of the final agreement that have or will have violated the Algonquins’ constitutional Section 35 rights; and no mention of Section 25 protections. Lack of agreements to ensure proper ongoing genealogy, enrolment, housing, education, and affirmative employment action; inadequate agreement on hunting rights and jurisdiction. The issue of the sacred Chaudiere Falls site in Ottawa being treated as private land, the proposed condominium development (the ‘Zibi’ project by Windmill Development Corp), and the vision of the late Algonquin Elder William Commanda for the site. they should not enter negotiations with the federal and prov. govt’s. The land is clearly their’s with overlaps with Haudensaunee. They should enter the negoatiations from a position of pwer; these lands are theirs’, and the Canadian gov’t just took them without any real compensation, except to set up ‘reserves’, which were a miniscule portion of the original landbase. It’s a shame. I hope the Anishinabe Peoples all get together, and stick it to the colonials, once and for all. Don’t take their money; take the land back.